We’ve snorkeled, fished, bicycled, hiked, day-tripped, swum, tanned and even read a book or two on our visits to Hopkins Village (Don’t think you’d call drinking an activity, but we’ve done that too. In moderation.) And we have walked from Hopkins Inn to the furthest point north in the Village to the furthest point south and beyond. If you stay at the Inn, Rita and Greg can arrange trips for you but there are others in the Village who can be equally helpful. Emma at AlternateAdventure offers all kinds of tours. She doesn’t do them herself but organizes them for others. She also rents motorcycles. 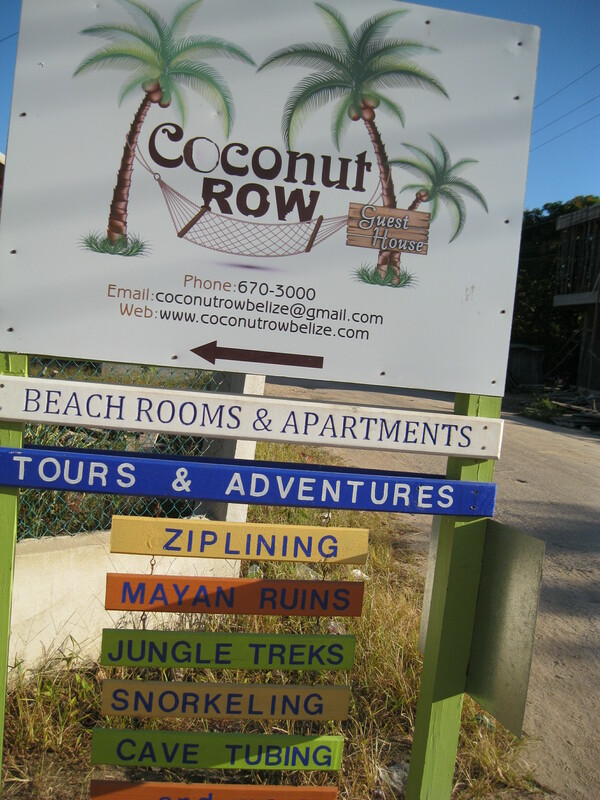 AlterateAdventures is a short distance from the intersection on the south side of the Village. Oli at the Windschief Beachbar, Internet and Cabanas, also on the south side, still rents windsurfing equipment and gives lessons. You can rent a bicycle at Freddies, down the road from Windschief, or possibly from your host wherever you are staying. You can go snorkeling with Noel Nunez. You can go fishing, sight-seeing or croc watching on the Sittee River with Levi Cuthkelvin. 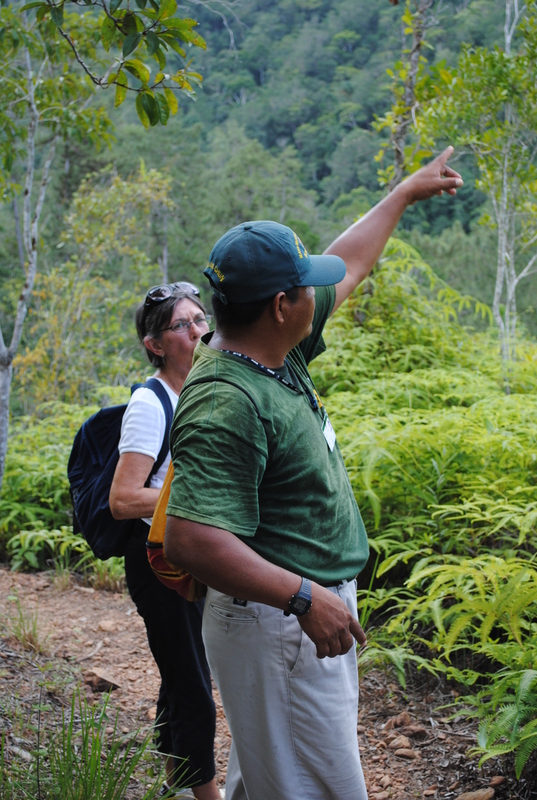 You can take a jungle walk at Coxcomb or Mayfair National Parks with Marcos Cucul. And something very new, you can zipline at Mama Noots Resort about six miles from the Village on the Southern Highway. 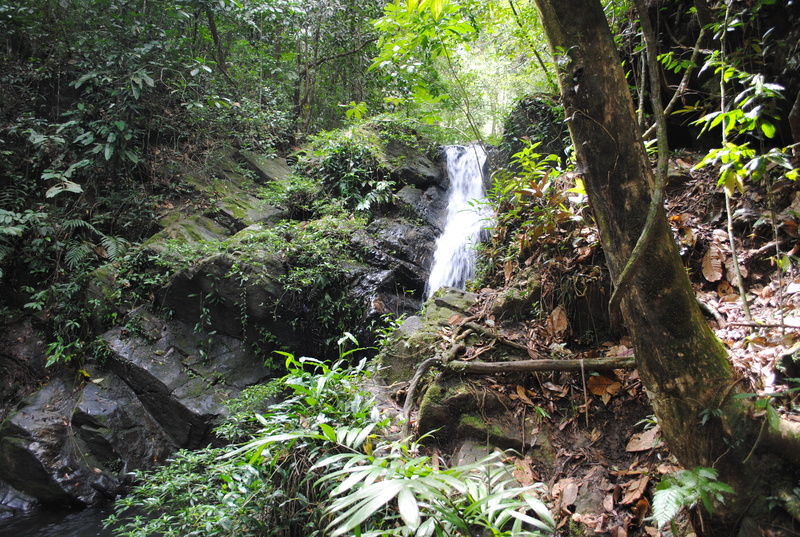 There are several beautiful waterfalls in that area where you can hike and swim. Talk to your host for further information, or check with Emma at AlternateAdventures, or just ask around. On a more sedentary note, you can track down Caitlin’s Bakery on the south side. Just follow your nose. Fresh breads, pastries, buns, cakes and cookies. Great with drinks on your verandah as the sun goes down. And, she is almost always open. You can walk and shop at two Maya/Guatemalan gift stores, one near the intersection by King Kasava and one across from Thongs on the south side. Check out David’s Woodcarving in the same general area. You can buy Belizean handicrafts made by Mayans in Punta Gorda in a new gift shop just past Hopkins Inn walking south. As you walk along the main street, you will likely find a local Belizean selling shell jewellery. What to do at night? Well, much more than meets the eye, really. There is live music from time to time at Driftwood Pizza on the north side. And live drumming from time to time at the Drum Centre. Occasionally a dance on the north side by the lagoon. Friday nights at Oli’s Windschief Beach Bar where large numbers of mostly expatriates gather to bring in the weekend with a boisterous bang. And a little south of the Village, several higher-end hotels offer entertainment. But let’s face it, folks. Outside of the bright lights of Belize City, in the Village it is mostly lights out by 10 p.m.
Years ago, there were few restaurants in Hopkins Village, all of them offering good Belizean food at reasonable prices but little to distinguish them one from the another except how far you would have to walk to get there. Today, there are at least 15 restaurants to choose from, offering Belizean, Chinese, Mayan/Mexican, pub grub, pizza, Italian, and continental. Starting at the north end of the village, you can get a good pizza at Driftwood Pizza, a funky restaurant on the beach run by a young Englishman and his partner. Walking south but still in the north end of the village, you will find Laruni Hati, a little place close to the Drumming Centre serving good local food. Just before the intersection dividing north from south, there’s a new restaurant called Tina’s Kitchen. This was a big re-discovery because we had been told that she had closed down her restaurant in the south end and moved on. This was bad news because we really liked her Belizean cooking. Some of the best we ever tasted. Then we found out she had not moved on but moved up and opened a new and much better place a block north of the intersection. We ate there three times in our short week in Hopkins Village, feasting on stewed beans and rice with chicken (Evelyn) shrimp and gibnut (Brian) and quesidillas, vegetable and chicken (Evelyn) and Amber Jack fish (me). It ain’t gourmet, nor meant to be Just real good Belizean cuisine. At the intersection, you can check out King Kasava which closed down last year but has re-opened for the 2015 season. Walking south of the intersection, there is another new eatery called Siomarra’s, a little place run by Mayan/Spanish people who offer an odd assortment of foods from burritos to chow mein. Down the road a bit and across the road there is Thongs. In its third or fourth season, this Italian/Russian owned restaurant offers a continental menu on the weekends and soup, salad and sandwiches for lunch. Further south, Sonia, a local resident, prepares pizza and standard Belizean fare such as fried chicken with rice and beans and coleslaw or potato salad. Not much further down the road, past the school on the beach side, turn into Windschief Beach Bar, Internet and Cabanas, a happening place on Friday nights. The bar fare is popular and the menu changes daily but fish and chips and burgers are always available and very, very good. Still walking south, Innie has re-modeled her restaurant and added outside seating. The restaurant still offers good Belizian food for breakfast, lunch and supper and the price is right. Next on your perambulation, you will arrive at Iris’ Restaurant, formerly, like Innies, a Village land-mark. Now it has changed hands, been renovated with a spacious patio and re-named Sunny Side Up. It is now owned and managed by a South African woman who has changed the menu; the reviews have been mixed. Across the way by the Whistling Sea’s Cabanas, there is a Chinese restaurant called Rainbow where you can dine-in or take-out. It’s still going strong and does an active local business. Then, further down the road on the left hand side, Frog’s Point has re-merged in a new location. 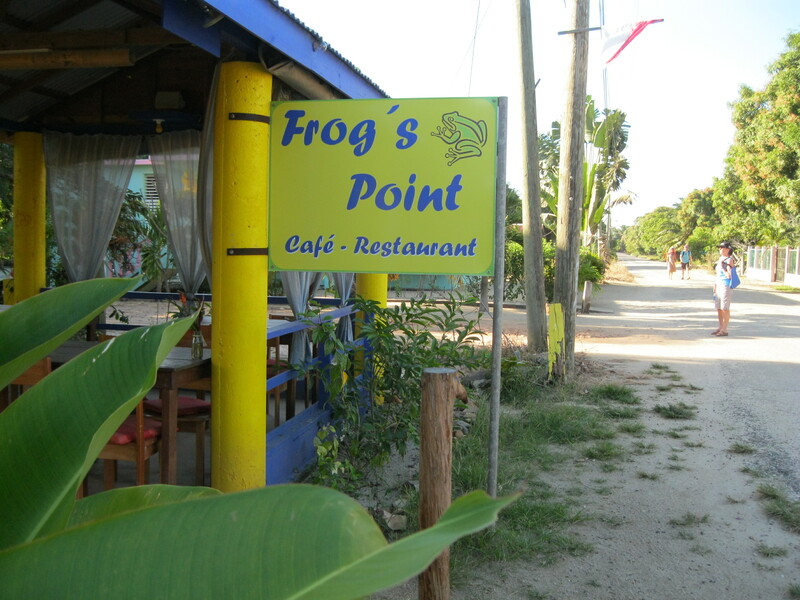 It offers a Continental menu with a Belizean twist in a friendly and comfortable setting. Somewhat more expensive than straight Belize, but worth the step up for a night out . The times they are a changin’. But change or not, Hopkins Village is still a place you visit to relax, going for long walks, biking the Settee River area with a picnic lunch, swimming, sunning, reading and just generally enjoying yourself. You have the chance to meet the locals and fellow travelers or, if you wish, to spend your time alone with your partner or your pal as the days melt by and you have to bid farewell to the cozy Village on the shore of the Caribbean Sea. This entry was posted on Friday, January 31st, 2014 at 7:17 pm	and posted in adventure, Travel. You can follow any responses to this entry through the RSS 2.0 feed.